Apple is dominating the tablet market with iPad 1 and iPad 2 since ever. Actually there was no real tablet market before the release of iPad 1. The sudden success of the iPad “forced” many other companies to get into the process of developing their own tablet and try to challenge Apple. Among the strongest tablet contenders are 3 tablets running the newly released Android 3.0 OS. These are the Motorola Xoom, the Samsung Galaxy 8.9 and Toshiba (still unnamed device). Are these devices ready to threaten the iPad or is it just another failed attempt? Can Google win the tablet market as they did with the smartphone market a couple of months ago? No one can be certain what the next few months will reveal but for sure these 3 devices can stand up next to the iPad without shame or fear. The Motorola Xoom is an android tablet with terrific specs. Running the Android 3.0 OS, it trumps the iPad 2 in a number of areas. Motorola’s philosophy seems to have been to take a spec rich approach to the Xoom and in many ways it seems to have worked. The Xoom uses a 1GHz NVIDIA Tegra 2 Dual Core Processor and has 1 GB of RAM. This pairing allows for lightening quick functionality and amazing multitasking capabilities up there on a similar terrain to the iPad 2. Screen wise it sports a 10.1 inch screen that’s close to half an inch larger than the Apple screen. Its two cameras are far superior in quality to iPad 2, on both the back and the front – one is a 5MP, the other a 2MP. It should be noted the device is slightly larger and heavier than the Apple iPad 2. The Xoom also has HDMI and USB ports can run Flash player and also has a SD port that allows the addition of up to 32GB of extra memory to its 32GB of internal fixed memory ñ Apple’s iPad has none of the aforementioned but comes into 16/32/64 GB versions. Not released yet the Samsung Galaxy Tab 8.9 is aimed to be slightly cheaper than the Apple iPad 2 on price, but will have similar specs. The Galaxy Tab 8.9, not released until the middle of summer, will be slimmer and far lighter than the Apple iPad 2 – making it a far more portable option. The Samsung will also offer an 8.9 inch display at a 16:9 ratio, displaying LCD images with a stunning resolution of 1280×800. It will also use the same chip as the Xoom, the 1GHz NVIDIA Tegra 2 Dual Core Processor and Honeycomb OS. Meaning it will be somewhat akin in power and capability to that of the iPad 2. As far as cameras go, it has by far the best, with an 8MP flasher on the back capturing at 1080p as well as a 2MP camera on the front. It will support flash player (all android 3.0 devices have support for Flash Player 10.2) and has USB ports and a SD port to increase the memory by up to 32GB, on top of its internal 16 GB or 32 GB size. The fact the Samsung is cheaper, smaller and just as powerful shows how serious Samsung are about taking a bite from Apple’s apple. Toshiba’s new tablet, to be released in the second half of this year, is also looking like an iPad threat. It will run the same Honeycomb OS as the other two Android tablets; the Toshiba will also offer an array of top end specs to consumers. This will surely mean it will be as much of a player in the Android market as in the tablet market as a whole. The tablet is expected to have a 16:10 ratio, seen as more viable for a media orientated machine and will have a removable battery, coloured covers that can be swapped and mini USB ports. The iPad may be the consumer choice for now, but with these three big boys on the horizon we can be confident that Android 3.0 is pushing things in the right direction. Who the winner will be it’s up to the consumers to decide but the good news is that we now have more choices and the increased competition will lead to the development of better and cheaper tablets. This a guest post by: Alex. Alex writes about gadgets and you can read the latest android tablet reviews at thebestandroidtablet.com. Great stuff. I think android is starting to be really popular but the new ipad 2 was sold out on first day! Apple has done very well on iPhone and Ipad however many people now switting from iPhone to android phones which are, lets say, much better than apple. I think HTC will be able to keep pace with Apple. They are starting to show they make really good phones. The problem is Apple has been first to market and it is also the best product…Im no business expert but Im pretty sure first to market plus an awesome product equals success. The mobile space is getting pretty sweet regardless! There all so expensive though…its unfair. iPad 2 still best imo. Played with the Motorola some last night in a Best Buy mall store which was right next door to the Apple store. Then went next door and played with the iPAD II. No comparison. Apple owns this market they invented. Everything else feels like a cheap imitation. Yup Motorola Zoom is enjoying a good run these days, but the figurative sales aren’t as much as that of the iPad. Google android honeycomb tablets take upon ipad initial vital ipad aspirant motorola xoom gets reviewed jobs ipad has competitors brings ipad competition. By the way, nice stuff, nice share. Thanks. I dont think Apple has any comparison. I have tried with Samsung Galaxy, but Apple seems to be dominating. I have been heavily considering the Ipad 2. I have a droid x phone and it has been freezing up on me quite a bit. Now that Verizon has the Iphone, I have been really thinking of making the switch to that and an ipad to boot. I have been resistant to change to a MAC, but if they are as good as everyone seems to be saying, I think it would be worth taking a shot with them to see how they perform. I’m curious whether the 3 competitors will succeed to dethrone Apple. It’s true Apple products are expensive, but they also prove real quality. 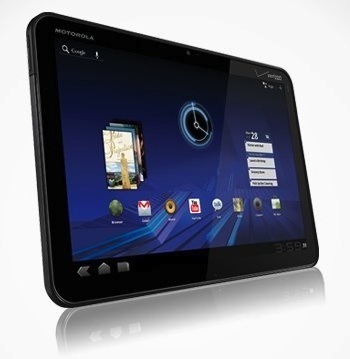 Motorola Xoom seems the main competitor based on your review. The general consensus is that Apple’s iPad is the best tablet there is. And this is supported by the fact that they were the first to successfully market the gadget, and so far, their’s is the most expensive (and you know what people equate expensive things with). Functionality-wise, the competition seem to approach that of the iPad and may even surpass some of its features. That leaves everything, at least for me, to aesthetics. I for one have yet to buy my own tablet and if it comes to a final selection, I’d probably fall for the one that looks aesthetically pleasing the most. Galaxy has proven itself as true competitor of IPad with same existing features at less price compare to apple. It has high demand in Asian countries with best customer support. Rest two hasn’t proved to be that much worth. I highly expect the iPad 3 to be launched at lower price points than 1 and 2, due primarily to the entrance of low price point competition such as the Kindle Fire. The Kindle Fire is really the only true competition to the iPad to date and if Apple does lower the price point, 2012 could truly become the year of the tablet wars. När ska det komma några bra appar för musikproduktion till Android? iPad ligger väl fortfarande ljusår före..
Kanske kommer den att dominera design/film/musik-branscherna som Apples’ datorer har gjort? I am Great Android lover, I have several reasons why to select Android tablet instead of iPad?